The food you eat will no longer go into some parts of your stomach and small intestine that absorb food. Because of this, your body will not get all of the calories from the food you eat. The first step makes your stomach smaller. 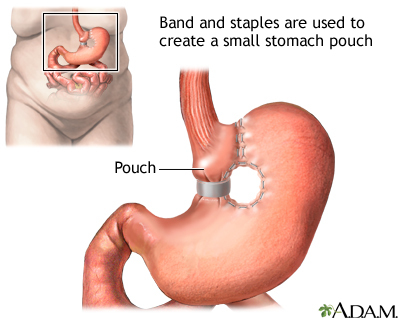 Your surgeon uses staples to divide your stomach into a small upper section and a larger bottom section. 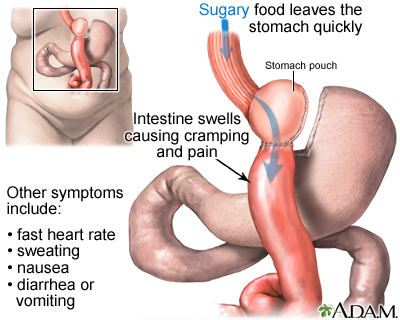 The top section of your stomach (called the pouch) is where the food you eat will go. The pouch is about the size of a walnut. It holds only about 1 ounce (oz) or 28 grams (g) of food. Because of this you will eat less and lose weight. The second step is the bypass. Your surgeon connects a small part of your small intestine (the jejunum) to a small hole in your pouch. The food you eat will now travel from the pouch into this new opening and into your small intestine. As a result, your body will absorb fewer calories. 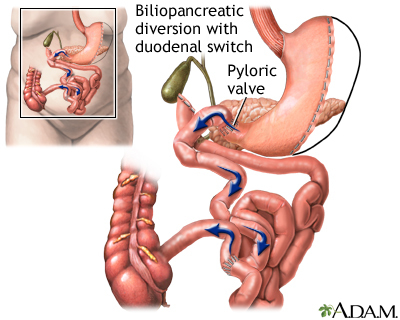 Gastric bypass can be done in two ways. 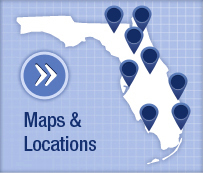 With open surgery, your surgeon makes a large surgical cut to open your belly. 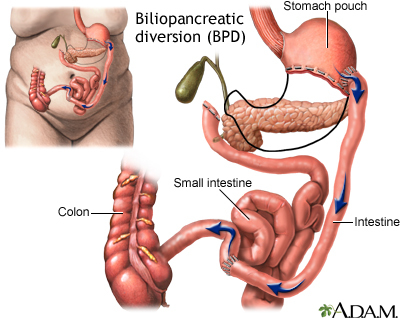 The bypass is done by working on your stomach, small intestine, and other organs. Another way to do this surgery is to use a tiny camera, called a laparoscope. This camera is placed in your belly. The surgery is called laparoscopy. The scope allows the surgeon to see inside your belly. The surgeon makes 4 to 6 small cuts in your belly. The scope and instruments needed to perform the surgery are inserted through these cuts. The camera is connected to a video monitor in the operating room. This allows the surgeon to view inside your belly while doing the operation. Weight-loss surgery may be an option if you are very obese and have not been able to lose weight through diet and exercise. Doctors often use the body mass index (BMI) and health conditions such as type 2 diabetes and high blood pressure to determine which people are most likely to benefit from weight-loss surgery. Gastric bypass surgery is not a quick fix for obesity. It will greatly change your lifestyle. After this surgery, you must eat healthy foods, control portion sizes of what you eat, and exercise. If you do not follow these measures, you may have complications from the surgery and poor weight loss. Be sure to discuss the benefits and risks with your surgeon. A BMI of 40 or more. Someone with a BMI of 40 or more is at least 100 pounds (45 kilograms) over their recommended weight. A normal BMI is between 18.5 and 25. A BMI of 35 or more and a serious medical condition that might improve with weight loss. Some of these conditions are obstructive sleep apnea, type 2 diabetes, and heart disease. 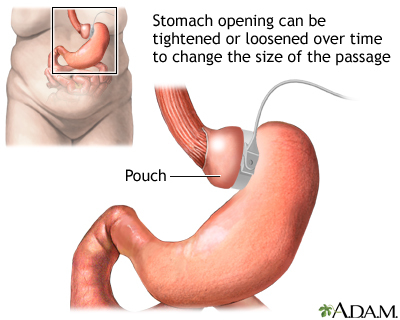 Gastric bypass is major surgery and it has many risks. Some of these risks are very serious. You should discuss these risks with your surgeon. 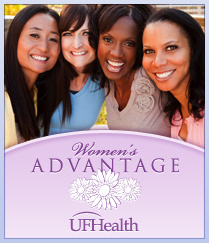 Blood tests, ultrasound of your gallbladder, and other tests to make sure you are healthy enough to have surgery. Visits with your doctor to make sure other medical problems you may have, such as diabetes, high blood pressure, and heart or lung problems, are under control. Classes to help you learn what happens during the surgery, what you should expect afterward, and what risks or problems may occur afterward. You may want to visit with a counselor to make sure you are emotionally ready for this surgery. You must be able to make major changes in your lifestyle after surgery. If you smoke, you should stop several weeks before surgery and not start smoking again after surgery. Smoking slows recovery and increases the risks for problems. Tell your doctor or nurse if you need help quitting. You may be asked to stop taking medicines that make it hard for your blood to clot. These include aspirin, ibuprofen (Advil, Motrin), vitamin E, warfarin (Coumadin), and others. Most people stay in the hospital for 1 to 4 days after surgery. You will be asked to sit on the side of the bed and walk a little on the same day you have surgery. You may have a (tube) catheter that goes through your nose into your stomach for 1 or 2 days. This tube helps drain fluids from your intestine. You may have a tube connected to the larger part of your stomach that was bypassed. The catheter will come out of your side and will drain fluids. You will receive shots of medicine to prevent blood clots. Be sure to follow instructions for how to care for yourself at home. Most people lose about 10 to 20 pounds (4.5 to 9 kilograms) a month in the first year after surgery. Weight loss will decrease over time. By sticking to your diet and exercise from the beginning, you lose more weight. You may lose one half or more of your extra weight in the first 2 years. You will lose weight quickly after surgery if you are still on a liquid or pureed diet. Buchwald H. Laparoscopic Roux-en-Y gastric bypass. In: Buchwald H, ed. Buchwald's Atlas of Metabolic and Bariatric Surgical Techniques and Procedures. 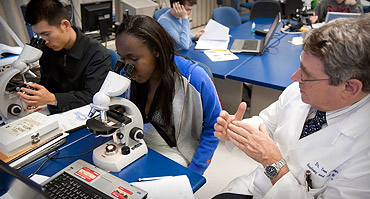 Philadelphia, PA: Elsevier Saunders; 2012:chap 6. 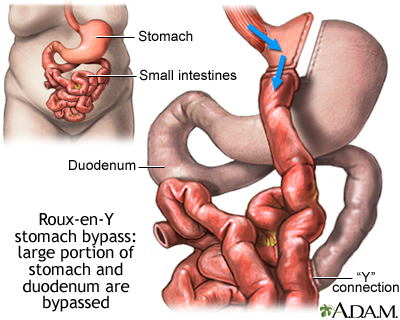 Buchwald H. Open Roux-en-Y gastric bypass. In: Buchwald H, ed. Buchwald's Atlas of Metabolic and Bariatric Surgical Techniques and Procedures. Philadelphia, PA: Elsevier Saunders; 2012:chap 5. Halperin F, Ding SA, Simonson DC, et al. Roux-en-Y gastric bypass surgery or lifestyle with intensive medical management in patients with type 2 diabetes: feasibility and 1-year results of a randomized clinical trial. JAMA Surg. 2014;149(7):716-726. PMID: 24899464 www.ncbi.nlm.nih.gov/pubmed/24899464. Mingrone G, Panunzi S, De Gaetano A, et al. Bariatric-metabolic surgery versus conventional medical treatment in obese patients with type 2 diabetes: 5 year follow-up of an open-label, single-centre, randomised controlled trial. Lancet. 2015;386(9997):964-973. PMID: 26369473.\ www.ncbi.nlm.nih.gov/pubmed/26369473. Richards WO. Morbid obesity. In: Townsend CM Jr, Beauchamp RD, Evers BM, Mattox KL, eds. Sabiston Textbook of Surgery. 19th ed. Philadelphia, PA: Elsevier; 2012:chap 15. Thompson CC, Morton JM. Surgical and endoscopic treatment of obesity. In: Feldman M, Friedman LS, Brandt LJ, eds. Sleisenger and Fordtran's Gastrointestinal and Liver Disease. 10th ed. Philadelphia, PA: Elsevier Saunders; 2016:chap 8. Ann Rogers, MD, Associate Professor of Surgery; Director, Penn State Surgical Weight Loss Program, Penn State Milton S. Hershey Medical Center, Hershey, PA. Internal review and update on 08/05/2016 by David Zieve, MD, MHA, Isla Ogilvie, PhD, and the A.D.A.M. Editorial team.